"This is FUNSICAL a progressive sequence of Movement, Music and Language development activities to keep children consistently Moving and Improving! This program is GUARANTEED to improve children's physical, mental and emotional strength and conditioning, as well as language comprehension, concentration, behavior and speaking skills. Through our Funsical School training programs, audio recordings, coordination kits and curriculum materials children will learn the progressive steps that will give them opportunity to practice the developmental activities that build the skills necessary for achieving optimum proficiency and potential success in athletics, music, drama, dance, sports, speech, and academics. 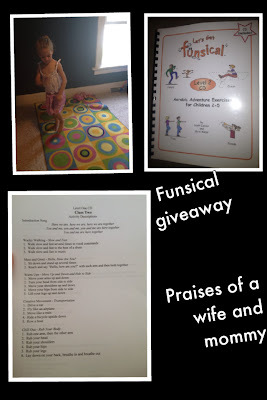 Funsical offers children a simple, comprehensive sequence of activities for building strength, balance, endurance, character, confidence and coordination while learning to identify, comprehend and speak the basic terminology of the English language. It utilizes developmentally appropriate movement, vocalization, sensory integration, drama, humor, athletics, music, rhythm and dance techniques developed by a variety of professional educators, medical professionals, speech, occupational and physical therapists to enhance children's motor, cognitive and social-emotional development." 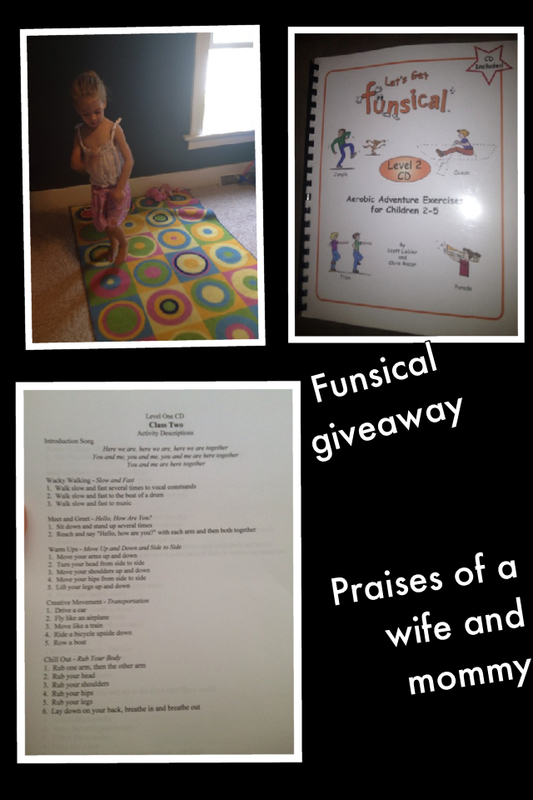 Thank you Funsical for sending me Level 1 and Level 2 for my review, and for sending a winner of the giveaway a copy of Funsical. All opinions are 100% mine. Level 1 includes, pets, transportation, zoo, and work. Level 2 includes, Jungle Journey, Ocean Voyage, Train Ride, and Parade. Both CD's are for children aged 2-5. Each CD came with a manuel that breaks each CD into different classes. If I was still teaching full time I would love this package. It would work well in the schools I substituted at, where Wednesday's were Workout Wednesday's and each teacher had to find an activity to do. This CD includes fun music and lots of movement that is fun and very interactive. There are a total of 6 different CD's that range in different age groups. Each CD is $19.95 or $89.99 for the set, but you can also digitally download individual classes for $4.99 each. They also have a few other packages for sale that include some extra fun stuff too. After I read through parts of the manuel I put the CD in for my daughter and son. I was pretty happy that I did not need to give much direction as the CD does a great job of that. There were only a couple times when I had to show my daughter the actions that would be best for a certain part. I had fun watching my son trying to copy his sister too. He is only 16 months old so he is a bit young to follow directions but copy cat was still great for him. My daughter said she had fun and was excited when I told her there was another CD. We did the entire first CD in one sitting which could be 4 different lessons. :) WE were just having too much fun to take a break. I think any teacher would love to have this as well as parents, Sunday School Teachers, and homeschooling families. Enter the giveaway through the easy rafflecopter form below. GOOD LUCK! I learned that soon they will have on-line video training. I'd use this with the children in our family. I learned that they offer workshops! I would use this with my preschool class. I would use it with my girls. I learned that this program is guaranteed to improve children's physical, mental and emotional strength and conditioning, as well as language comprehension, concentration, behavior and speaking skills. I would use it with my 2 and 4 year olds. I will use this CD with my son and daughter 2 and 4. I learned that the program will improve concentration, behavior and speaking skills among several other things! FUNSICAL is a sequence of Movement, Music and Language development activities to keep children consistently moving and improving!